As the name might suggest, Déjà Vu has done it again. 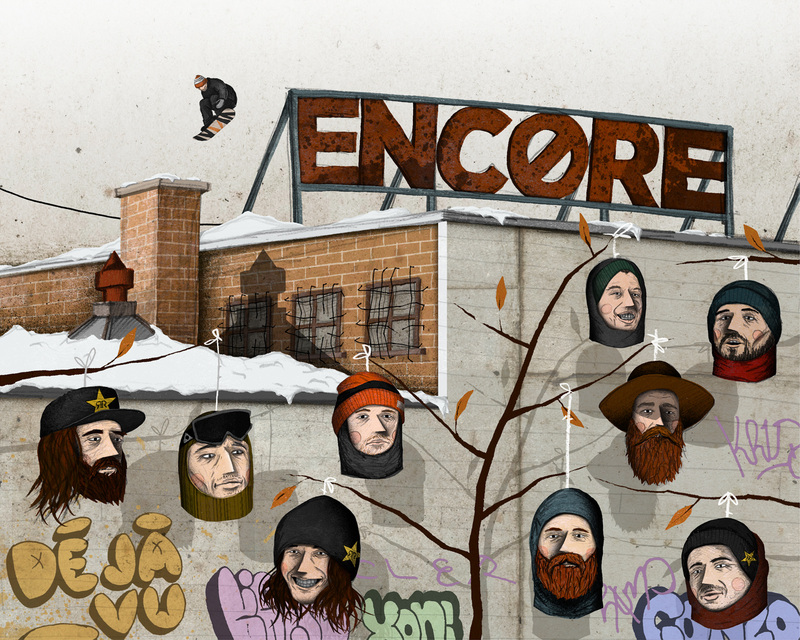 Back in 2006, eight French Canadian no-names set out to set the snowboard world on fire, and ten years later they have done it…twice. With their first self-titled film, they proved to all onlookers that they were the real deal, as one of the most anticipated films of that year lived up to every expectation. However, they say that legacy is borne in the sequel, and Déjà Vu did just that, with Encore. By pulling in two other riders in newcomer Dillon Ojo and veteran Jake Kuzyk, the crew went from eight to ten of the best jibbers in the world and the result is a cinematic stunner for the ages. Louif Paradis, Phil Jacques, Alex Cantin, Laurent-Nicolas Paquin, Nic Sauve, Frank April, Ben Bilocq, Will Lavigne, Kuzyk and Ojo star in this film by renowned director Hayden Rensch as well as filmers Harry Hagan and Tanner Pendleton filming everything from full HD to 8mm and the product speaks not jut in the riding but in the way the film was edited. Not only is every single trick in the movie a potential ender, but every shot is perfectly in sync with the music which ranges from scored instrumentals to downright death metal hits, and that makes it the most complete package of any release this winter. Take it from backcountry specialist and a man who probably hasn’t stepped to a street rail since his days as a Burton grom, Mikey Rencz. He says, “I just really enjoy watching all these guys shred. It was the only movie I watched this year that I really wanted to watch again after it was over. Quality shredding from the Frenchmen!” Icelandic sensation and no stranger to the streets himself, Halldór Helgason wrote in, “Insane riders, insane spots and good music.” The man responsible for this genre of snowboarding is none other than JP Walker, and he chimed in with his vote as well, saying “Lots of hammer parts in there,” while the current face of mainstream snowboarding and 2014 slopestyle Olympic gold medalist Sage Kotsenburg gave it his nod with “Such next level trick, and it was visually entertaining.” Well, our hats are off to Déjà Vu for taking home Movie of the Year honors, and we would like to take this space on the internet to personally request an encore performance of Encore. Tabarnac!